Here’s a not-so-hidden secret, the Ontario Liberals are going to use your money to ensure they get re-elected in 2018. 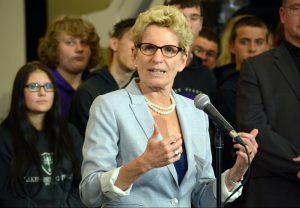 It will be through grandiose funding announcements, spending all over the province and they will use language such as “investments in our future” while at the same time racking up Ontario’s already unwieldy $312 billion debt. The Liberals won’t be particularly subtle about their spending either, frankly they don’t have to be — they currently have a majority government and can use the public purse as they see fit, no matter how fiscally irresponsible they have been. However it’s still worth pointing out the initiatives they announce are dripping with political opportunism. Take the latest from embattled Health Minister Eric Hoskins for example. The Liberals providing temporary funding for over 1,200 hospital beds sounds great — but doesn’t come close to addressing the long-term crisis of bed shortages. Even the Ontario Health Coalition, as Antonella Artuso reported, sees right through this obvious election ploy referring to it as “cynical” while pointing out the funding will likely decrease after the election is over. But it’s a clever move, even if it’s temporary funding. The Liberals are likely working on an advertising campaign designed to tout their benevolence while simultaneously scare Ontarians from voting for Patrick Brown’s Progressive Conservatives, who consistently beat the Liberals in public opinion polling. And speaking of cynical, how about the Fair Hydro Plan which Ontario’s Auditor General just ripped to shreds. The “plan” will cost nearly $40 billion, and artificially keeps electricity rates down. Here’s the election kicker — just in time for the 2018 campaign, the rates will be the lowest, then will increase every year following. How convenient. Those campaign commercials practically write themselves. Earlier this year the Liberals bought themselves labour peace till after the next election offering contact extensions for teachers and education workers and two of the biggest unions representing thousands of public servants across Ontario. And they vote — in droves. They know having a Liberal government in the pink palace is in their respective unions’s best interest, so why not keep them there? After all, Premier Kathleen Wynne and Dalton McGuinty before her, weren’t coy about keeping the unions happy. But the one thing that is going to likely hurt young workers and those who aren’t as highly skilled the most, was the ramming through of the increased minimum wage. Study after study has shown that with increased labour costs and regulations, employers will hire less. Not to mention industry will respond to governments obscene financial demands by being more innovative and use technology to replace workers. None of these facts seem to matter though, the Liberals needed an issue to take away from their left flank — the NDP — and this was it. So the Liberals have kicked in their re-election strategy, the question is — will Ontarians be fooled into buying what they are selling us, using our own money?